The Walking Dead is one of the biggest shows on TV, so a role on the series is a pretty sweet gig. Sadly for actors, it’s also often a brief gig given the short lifespans of most of the characters. 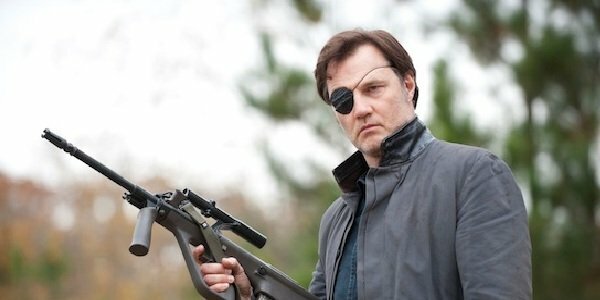 David Morrissey’s epically villainous Governor was a major antagonist in the third and fourth seasons before being skewered through the chest and shot in the face. Morrissey has now landed a role on a new show on which he might come to a decidedly less gruesome end. He'll star in the second season of Golden Globe- and Emmy-nominated anthology series The Missing on Starz. According to TVLine, David Morrissey will be playing a lead character called Sam. Sam and his wife Gemma lost their daughter Alice after she went missing in 2003. When Alice seems to reappear after 11 years, the family must deal with the aftermath. The story will be told via dual timelines in the same manner as the first season. The two seasons will have unconnected storylines with only French detective Julien Baptiste as a major character appearing in both. In addition to David Morrissey as Sam, Gemma will be played by Keeley Hawes and Baptiste will be played once again by Tcheky Karyo. The Missing will not be David Morrissey’s first return to the small screen since leaving The Walking Dead. He joined the cast of CBS’ summer drama series Extant in its second season to play General Tobias Shepherd. Unfortunately for the cast, the show was cancelled by CBS after Season 2 and it will not return for a Season 3. Interestingly, Morrissey worked alongside Jeffrey Dean Morgan on Extant, and Morgan will be tackling the role of the villain Negan on The Walking Dead. Perhaps Morrissey has been able to give him a few tips on how to be even more terrifying than the zombies in the zombie apocalypse. Filming has not yet started for Season 2 of The Missing, so while we assume Morrissey will be playing Sam with his native English accent, he might for some reason go American a la the Governor or take on an entirely different twang. Hopefully for the sake of Morrissey’s depth perception, Sam won’t be another character to have to wear an eyepatch. The second season will run for eight episodes, all of which will be written by Season 1 writers Harry and Jack Williams. Hopefully, Sam will be as fleshed-out as the characters from the first season so that Morrissey will have solid material to work with. Considering that he’s been able to play people ranging from a good guy on a Doctor Who Christmas special to a very bad guy on The Walking Dead to Shepherd on Extant and beyond, there can be no doubt that Morrissey has what it takes to make Sam an unforgettable character in Season 2 of The Missing.